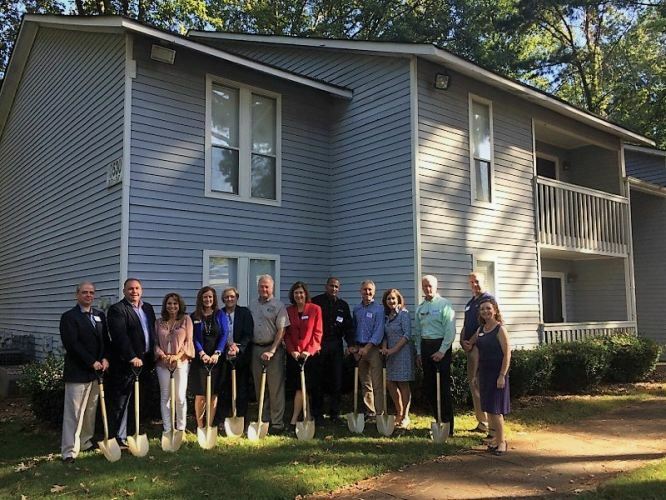 ROSWELL, Ga. - Oct. 11, 2017 - PRLog -- HomeAid Atlanta and The Drake House celebrated the groundbreaking of The Drake Village with volunteer Builder Captain Dan O'Dwyer of O'Dwyer Homes on Friday, October 6. The Drake Village is a renovation of two eight-unit apartment buildings located on the property adjacent to The Drake House's existing crisis housing complex. When complete, the new facility will more than double The Drake House's capacity to serve homeless women and their children, going from 44 beds to 100 beds. This will be HomeAid's third project with The Drake House, and Dan O'Dwyer's second. In 2006, Mr. O'Dwyer led a total renovation of two existing eight-unit apartment buildings with HomeAid, the first crisis housing ever offered by The Drake House. In 2015, Vincent Longo of Vincent Longo Custom Builders and HomeAid completed a 1,000 square foot expansion of The Drake Center, adding a "mom classroom" and teen center. The 2015 project also included a complete renovation of staff offices for ADA compliance. The Drake House Executive Director, Kathy Swahn shared her excitement over new project, "The Drake Village will allow us to double our capacity and offer extended housing for an additional 24 months to our successful graduates. By offering an affordable housing option at a time when market rents are escalating in our community, our mothers and children will be further stabilized and able to have program support and budget counseling. This is our third partnership with HomeAid Atlanta, and with the experience of Dan O'Dwyer having renovated our first sixteen units in 2006, we know he has the expertise and heart for this work. We are very grateful to be working with Dan again!" The Drake House provides short-term crisis housing, education and empowerment programs for homeless single mothers and their children in North Metro Atlanta, designed to provide stability for the children and assist the family in working toward self-sufficiency. Learn more at www.thedrakehouse.org. Help Homeless Babies: Join the Essentials Drive!